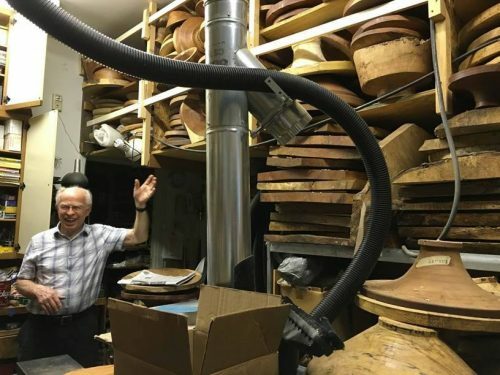 Phil Brown in his shop taken by Betty Scarpino during the Windgate ITE Fellows 2016 DC trip. Center for Art in Wood, in conjunction with its annual Windgate ITE International Residency Program. Phil Brown was a self-taught artist and craftsman, as well as an advocate and community builder for the field of art in wood. Though he had been drawn to woodworking from the time of his youth, he began turning at the age of 38, with a newly purchased lathe and a book to guide him. Phil became known for his fine bowl forms, which were turned from wood sourced from culled trees local to his home in the DC area. He was a great friend to The Center for Art in Wood, serving on its Board of Trustees and participating in some of the organization’s earliest exhibitions and symposia; a bowl from tulip poplar was included in the seminal juried exhibition Turned Object Show (1981), which was shown at venues across the United States. Phil was very pleased to have been able to set up this fund before his passing. He will be greatly missed. To honor Phil Brown please click the Donate (via PayPal) button below*. To read Phil Brown’s obituary click HERE. Note regarding donations by check: Checks must be made payable to “The Center for Art in Wood” with “Phil Brown Fund” indicated in the memo. Please send checks to: The Center for Art in Wood, 141 North 3rd Street, Philadelphia, PA 19106. *You do not need to have a PayPal account nor use PayPal to donate online–PayPal accepts Visa, MasterCard, American Express, Discover, JCB, Diner’s Club and EnRoute.